Also blazing stars, gayfeathers, and wandflowers. All plants, colorfully named. Providing a little exercise in taxonomic names vs. common names. #1 shows Romneya coulteri (aka Matilija poppy, tree poppy, fried egg plant, fried egg flower), #2 Dierama pulcherrimum (aka angel’s (fishing) rod, wand flower, (African) harebell, fairy wand). Meanwhile, the flower Chamaelirium luteum is most often called fairy wand, but has a number of other common names, including blazing star — though that common name is most often used for the flower Liatris spicata, which is also commonly known as gayfeather. 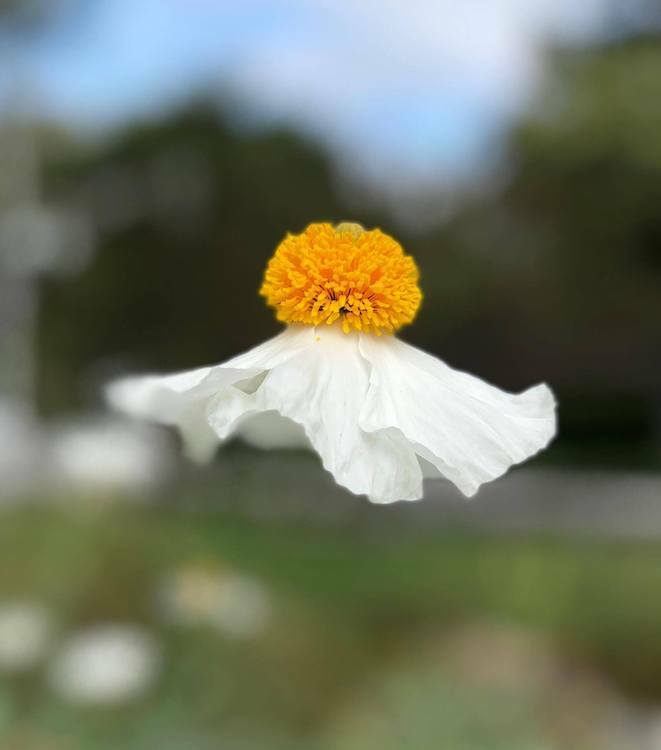 Romneya and coulteri are from proper names (Romney and Coulter); Matilija is a California place name (Matilija Canyon in Ventura County, with an originally Chumash name). The common name tree poppy alludes to the height of the plants (up to 7 ft., definitely big for a poppy). The names fried egg plant / flower are metaphorical, likening the flowers to fried eggs (with yellow yolks in the center of the fried whites). ‘Dierama’ is Greek for ‘funnel’ and describes the flower’s shape. The long narrow leaves suggested to me that this large and very striking plant might be in the grass family (Poaceae), the lily family (Liliaceae), or the iris family (Iridaceae). The flower buds on drooping stems look grass-like, but the big 6-petaled flowers are totally unlike grass flowers. Then I found a label, which took me to Wikipedia and the iris family. The species name is the Latin adjective pulcherrimus, -a, -um, the superlative form of the adjective pulcher ‘beautiful’; the superlative here is used “absolutely”, to convey ‘very’ rather than ‘most’. The regular superlative degree form in Latin has –issim– (bellissim– from bell– ‘pleasant, pretty, handsome’), but stems in liquids have special forms with phonological assimiation (difficillim– from difficil– ‘easy’, celerrim– from celer– ‘swift’). From this plant, most often known as angel’s fishing rod, we get to the alternative common names fairy wand and wandflower / wand flower. Being fond of queer-oriented plant names, I’ll take up fairy wand first; it will lead to blazing star, which will lead us to gayfeather (more queer interest). Then I’ll get back to wandflower. Chamaelirium is a genus of flowering plants containing the single species Chamaelirium luteum, commonly known as blazing-star [a name most often used for Liatris], devil’s bit, false unicorn, fairy wand [the most widely used name], and [has the alternative taxonomic name Helonias dioica]. It is a perennial herb native to the eastern United States. It can be found in a variety of habitats, including wet meadows and deciduous woodlands. 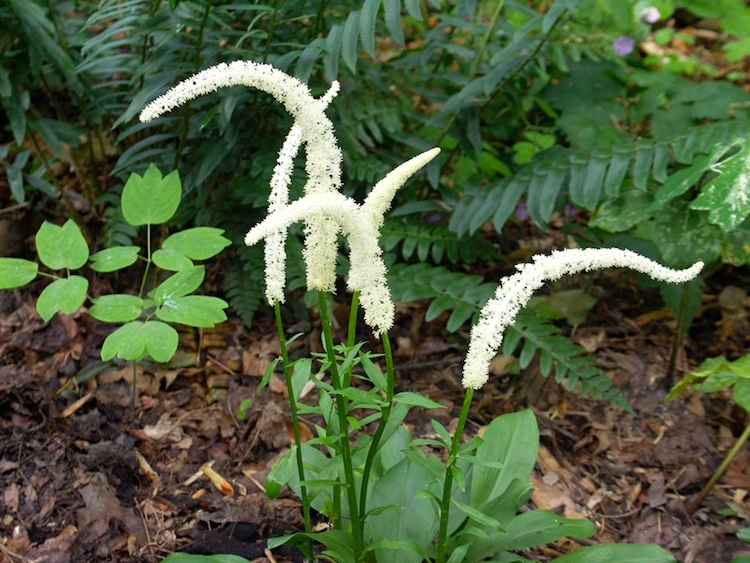 … Chamaelirium luteum is used as ornamental or medical plant. Fairy wand is also known as blazing-star / blazing star, a common name used most often for Liatris (a plant that grew in our Columbus OH garden). Liatris spicata, the dense blazing star [or blazing-star] or prairie gay feather [or gayfeather], is an herbaceous perennial flowering plant in the sunflower and daisy family Asteraceae. It is native to eastern North America where it grows in moist prairies and sedge meadows. The plants have tall spikes of purple flowers resembling bottle brushes or feathers that grow one to five feet tall. The species grows in hardiness zones 3 – 8, stretching from the Midwest to the East Coast and eastern Canada. … Liatris spicata is a garden flower in many countries around the world, grown for its showy purple flowers (pink or white in some cultivars). They bloom in July through August or September, depending on where in their range they are located. Under cultivation it is found under many names including button snakewort, Kansas gay feather, blazing star, Liatris callilepis. 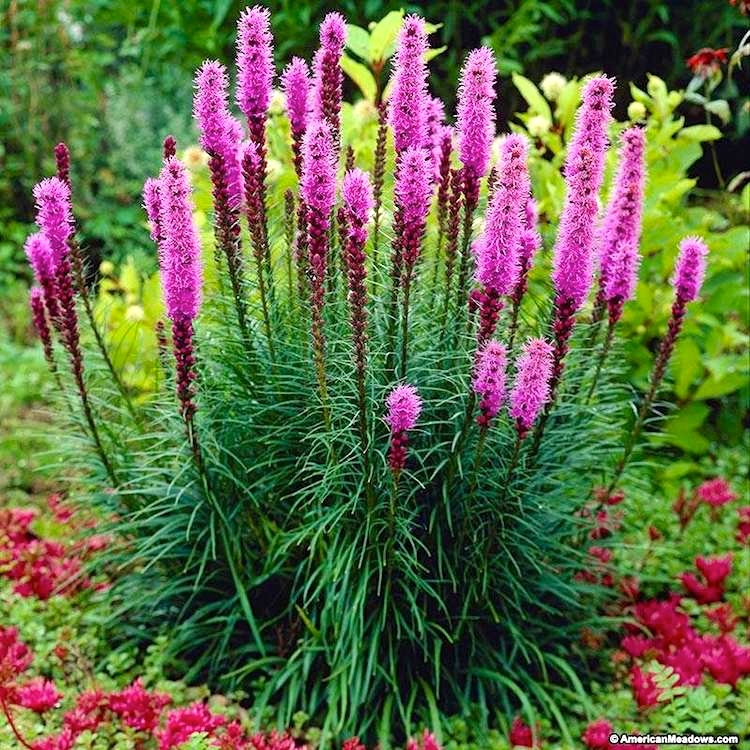 I have to confess that I originally bought Liatris plants for my Columbus garden because they were offered for sale under the name gayfeather. But they were attractive flowers under any name. 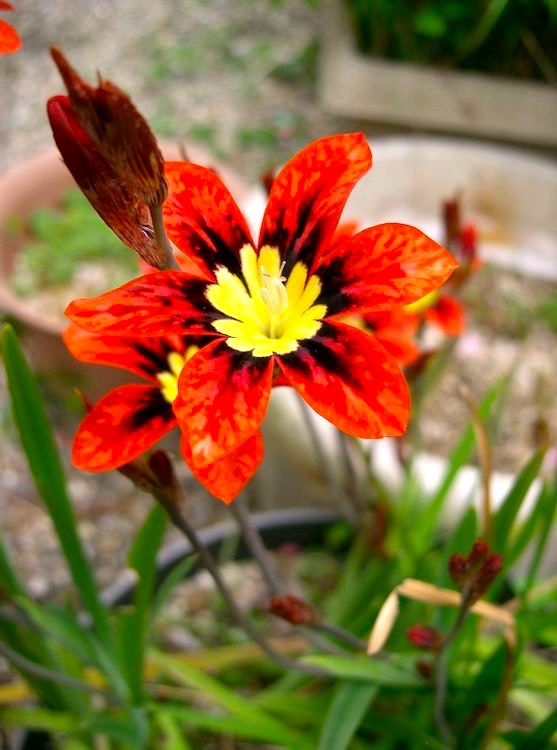 Sparaxis tricolor. Now back to wandflower / wand flower. 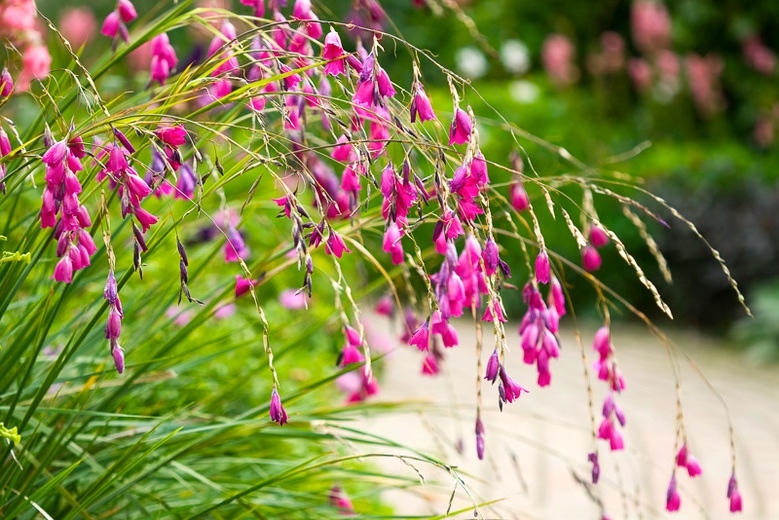 The common name used for several plants other than Dierama pulcherrimum, angel’s fishing rod, including the colorful bulb Sparaxis tricolor and Galax urceolata, a forest wildflower with spikes of white flowers. Galax, the wandplant, wandflower, or beetleweed, is a genus in the flowering plant family Diapensiaceae, containing a single species, Galax urceolata(syn. G. rotundifolia, G. aphylla). 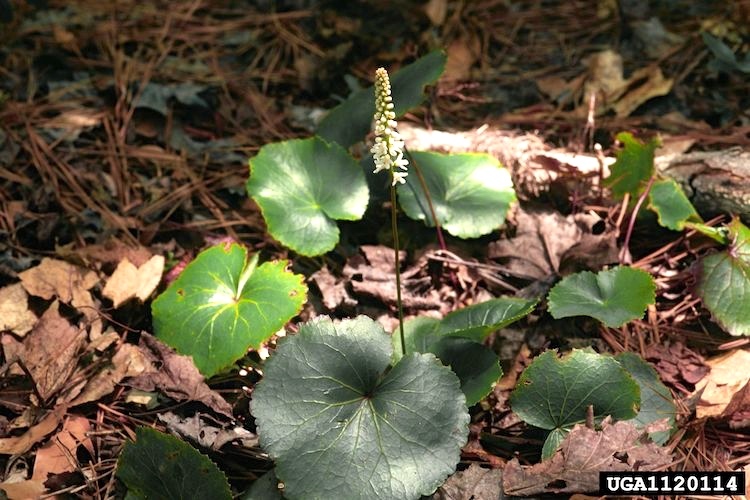 It is native to the southeastern United States from Massachusetts and New York south to northern Alabama, growing mainly in the Appalachian Mountains at altitudes of up to 1,500 m, where it grows in shaded places in forests. … The flowers are produced in late spring to early summer, white in color and on a single spike-like raceme 15–25 cm long on top of a 20–50 cm tall stem. As far as I can tell, harlequin flower (for Sparaxis) and beetleweed (for Galax) are unique as common names. But lots of things are possible in the world of common names. This entry was posted on June 18, 2018 at 10:47 pm and is filed under Language and plants, Latin, Metaphor, Names, Taxonomic vs. common, Technical and ordinary language. You can follow any responses to this entry through the RSS 2.0 feed. You can leave a response, or trackback from your own site.